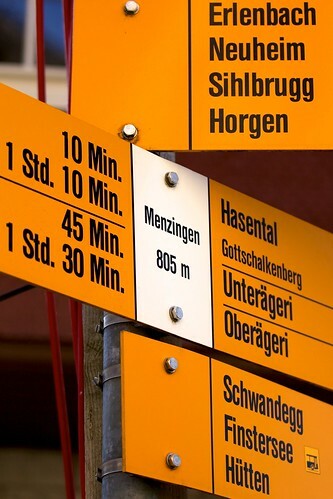 Basically every Swiss city, town, village, train station, or particularly wide spot in the road has one: the hauptwegweiser (roughly “central trail sign”), which tells you where you can go from here on foot, and approximately how long it will take you if you’re in decent shape and not taking too many photos along the way. Hiking is a big deal in Switzerland. The federal government holds the cantons responsible to maintain the hiking trail network, which measures 62’000 km. (By contrast, there are only 71’000 km of roads, and 5’100 km of rail.) Of course, the Swiss have been walking across the country since before they were Swiss. Trails began to be developed at the start of last century, as cars and trucks started making walking on the main roads uncomfortable or dangerous. The density of the trail network is impressive from an American point of view. Much of it crosses private property, which significantly reduces the difficulty of land acquisition for building out such a network. This approach is helped by Swiss law on rights of way on private property: there is an implicit right to use a path unless so signed, and the right to restrict usage is regulated by the local authorities. The density of the rail and bus network means that many of the hiking trails run from one stop to another, so there’s generally no need to plan for a loop. And the whole network is impeccably and beautifully mapped by the Swiss Federal Office of Topography, which publishes 247 sheets in 1:25k scale of the entire country with a design so elegant that Edward Tufte would be proud. The whole national map is available online. The end result is a system so well put together than you can literally go to a train station, hop on a random train or bus, get out, find the wegweiser to the next train station or bus stop, and start walking without much of a plan. This is the first in a very occasional series that on the old blog was called “Royale mit Käse”, sort of a set of short articles on “Switzerland for Americans”, that I figured I should start writing while I still remember what America is like. I’m taking requests, just drop me a line.